In three sizes, for single beds of 90 cm (36 in), 140 cm (55 in) or 160 cm (63 in). 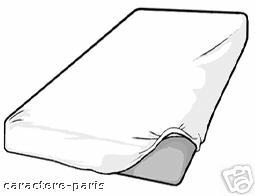 The covers fit mattresses of up to 20 cm (8 in) thick. Sizes: Single of 90 cm (36 in), Double of 140 cm (55 in) or Queen/UK King of 160 cm (63 in).